LIBERAL, Kan. – For the second straight year, the Seward County volleyball team has produced an NJCAA All-American. 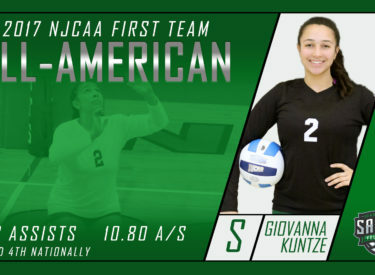 This year, Giovanna Kuntze took home the honors as a 1st Team selection on the All-American team. Kuntze, the Jayhawk West Most Valuable Player, is the first 1st Team All-American since 2004, the fifth 1st Team All-American in program history, and is the first setter in Seward history to be named an All-American. Kuntze had a breakout season, ranking 4th nationally in both total assists (1,242) and assists per set (10.80). Her efforts this season pushed her into the Seward County history books. Her 1,242 total assists on the season puts her in 8th place in the Lady Saint single-season record book, while her 1,726 career assists place her 7th all-time in Seward County volleyball. Her placement ability helped the Lady Saints lead the country in points per set (18.7). To go along with her assists, she also averaged 2.72 digs per set and 1.8 points per set. She helped lead the Lady Saints to an history season, finishing 32-3 with a perfect 16-0 conference record as they captured the Jayhawk West for the second straight year. Seward also tied a program record, being ranked as high as 3rd in the country. Kuntze becomes the 14th Lady Saint to be named an All-American, joining an illustrious list of players. This is the first time since 2007 and 2008 that Seward County has had back-to-back All-Americans, as Maritza Mesa was Honorable Mention a season ago.